I went to a wedding reception this weekend and LOVED the cake! 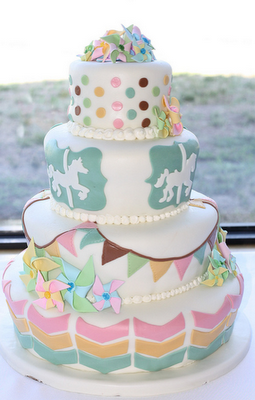 I need to learn how to use fondant....this is way. too. cute! They had their reception at a Carousel Museum, and everything was themed 'carnival'. I wanted to thank you yet again for this amazing web-site you have designed here. It's full of ideas for those who are definitely interested in this subject, especially this very post. You're really all absolutely sweet and thoughtful of others plus reading your blog posts is a superb delight if you ask me. And what a generous gift! Ben and I are going to have fun making use of your points in what we should instead do next week. Our list is a mile long and tips might be put to good use.